The final exam will cover all the materials in units 8-15 of the course. The final will consist of five parts: map quiz (25 points); five identification questions (50 points); surprise question (25 points); timeline (50 points) and essay (100 points). In the testing center, you will complete the five identification questions, the surprise question, timeline and the essay using Wordpad on a computer. You will then log into Blackboard to submit that part of the exam and to complete the map quiz part of the exam. For the Map quiz, you already have a copy of the Russia Outline Map (The printable version, which is a *.doc file, will be the one used on the exam although the exam copy will be a bit larger.) and the list of HIS 242 Map Items to be located on the map. On the exam, when you log into Blackboard, you will see a blank map with numbers on it, and you will have to put one of the items for each of the numbers on the map. 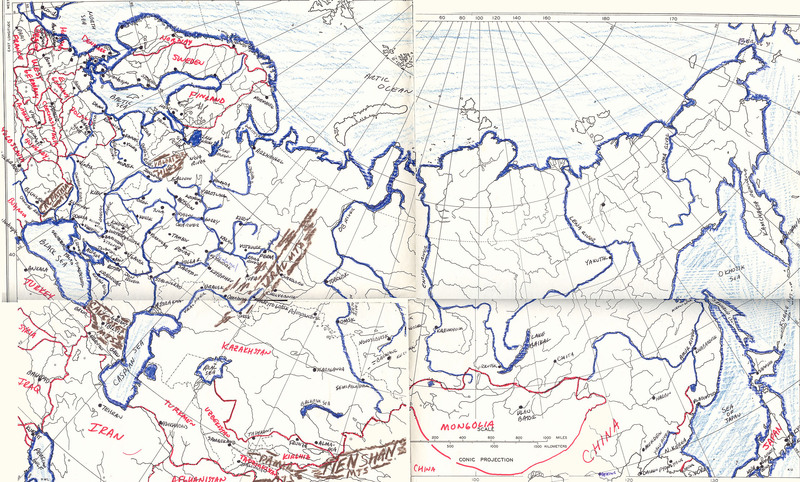 (I have available a copy of my old study map of Russia, which I have scaled down in size if you wish to use it as a reference. The original map was about 18X28 which made it much easier to locate the items, but that meant I had to scan pieces of it and then splice the pieces together.). The identification items will be taken from the Key Terms listed in the units. In a few sentences of about a paragraph length for each historical term, you will be asked to completely identify that term and note its importance. See the Sample Test Items. The surprise question will be taken from the Questions to Consider listed in the units. The surprise question will require about a long paragraph to complete. Way back in 1969, Andrei Amalrik posed the question, "Will the Soviet Union Survive until 1984?" Well, it is now more than twenty years after 1984, and the question that you will answer on the final exam is, "Will Russia Survive until 2025? You should analyze Russia's present condition, identifying some of Russia's strengths and weaknesses and noting some of the problems that Russia faces. Given your knowledge of Russian history in the twentieth century, you should then explain what you think will happen to Russia. Please take the time to organize your thoughts in a logical manner to support your analysis. Please be sure to read the short background information about Andrei Amalrik before you take your exam. Please review the ELI rules and regulations for examinations and the information on the course page in Blackboard about finding your exam passes and taking the course exams. If you live outside metropolitan Washington or are incarcerated or handicapped, see the information in the general ELI Policies and Procedures for exam proctors. Please do not let fear of the exams stop you from completing the course. If you have great difficulty getting to a Testing Center or are concerned about taking exams, please contact your instructor. There is no specific time limit, but it is recommended that you allow at least 3 hours to complete the exam. YOU CANNOT USE YOUR TEXT, NOTES, ELECTRONIC DEVICE OR ANY BOOKS TO TAKE THIS EXAM. NOTE: you will see your score for the map quiz immediately. Your instructor will grade the remainder of your exam and post your total score on the Blackboard gradebook. You will also receive feedback on your exam. The Final is worth a maximum of 250 points. You must pass the final exam with a grade of "C" (175/250) or better to earn a passing grade of "C" or better in this course.